Olivia is a very reliable, enthusiastic, vivacious professional who is also exceedingly passionate in real estate. She is very determined to peruse a rewarding career in the real estate industry and assist all landlords, tenants, vendors and buyers in attaining the best outcomes. 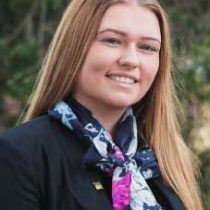 Olivia is equipped with customer service and has 4 years’ experience within the customer service industry, she strives to achieve that the customers that she has come in contact with have left feeling satisfied and welcomed back due to the presentation she has upheld and the assistance she has provided them with. Olivia is also a resident in Wantirna and has lived in the Knox area for 18 years, she is a devoted member of the Knox community and enjoys participating in outdoor activities and showing clients the best of what the Knox area has to offer.